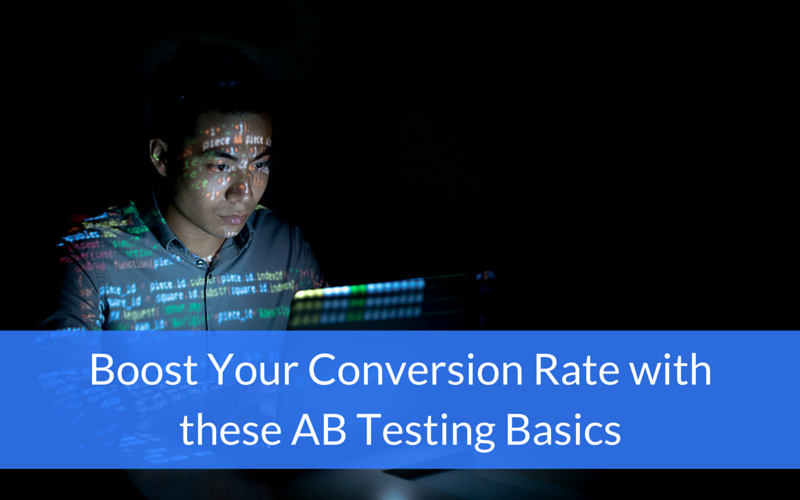 Doing AB testing is a great way to see if quick, minor changes can help improve your website’s overall conversion rate. Think of it this way: If taking five minutes out of your workday to make a simple change on your site resulted in even a 2% boost in conversions, would you do it? Of course you would! In this post we’ll cover the basics of AB testing, including what you’ll need to run one, how to make your tests successful, and how to get accurate results. A technique used to determine if a specific change made on a webpage can influence conversions in a positive way. It is implemented through the creation of a variation page (page B) whose results are compared with the ones of the original version (page A). The one that performs better in terms of conversions wins the challenge. In order to conduct a successful test, you must only test one element on the page at a time. Just like with a scientific experiment, you need your control (the original page) and your experimental page that only tests one variable at a time. Otherwise, if you test out multiple things at once, you won’t know which is positively or negatively affecting your conversion rate. While there’s only one variable allowed per page, this doesn’t mean you can only have one page live at a time. For example, let’s say you want to test out different colors for your most successful call to action (CTA). You can create four different pages, each with different color CTAs, and split traffic between them to see which one is the most effective. Also like scientific experiments, you need a hypothesis before you start. You don’t want to test just any element on a page willy-nilly; there needs to be a reason you want to perform the test. Using the previous example, maybe you have a high performing CTA that people seem to be responding to, and you want to see if you can get your click-through rate even higher by changing its color. Or maybe you’re using heat maps on your site to see where people are going on your page, how far down they scroll, and when they typically leave. You realize that many are bouncing off the page before they even get to your CTA, so you decide to run an A/B test to see if moving your CTA up to the top of the page will increase your conversion rate. All versions of your page are live on your site at the same time (this way results won’t be influenced by current trends, seasonality, etc.). Traffic is split equally between versions. If this isn’t possible or simply doesn’t happen, be sure to keep the ratio between number of views and clicks in mind when analyzing the results. All versions must run for the same amount of time; this amount must be long enough to provide accurate results. You may be thinking, “If I have multiple pages with the same content live on my site at the same time, won’t search engines ding me for duplicate content?” Thankfully there’s a way around this. Using rel=“canonical” tags to indicate the original version of the page will help search engine spiders know which page came first. Furthermore, after you do select the winning version of the page, you can use a 302 redirect (instead of a 301) from the pages not chosen to tell spiders that those variation pages are temporary and part of a test. What other AB testing basics do you abide by? What have been your biggest findings from such tests? Let us know in the comments!